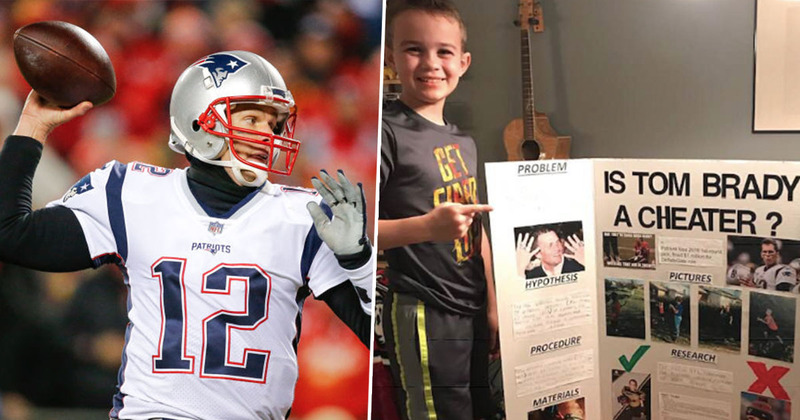 A 10-year-old boy won his school science fair by supposedly proving American footballer Tom Brady cheated by deflating balls. The ‘deflategate’ controversy centred around a Championship Game of the 2014–15 National Football League (NFL) playoffs, in which quarterback Brady allegedly ordered the deliberate deflating of footballs in the New England Patriots game against the Indianapolis Colts, giving his team an illegal advantage. In the NFL, each team uses its own balls while on offence. Brady was suspended without pay for four games of the upcoming season for his involvement, but when the matter moved to federal court, Judge Richard M. Berman vacated the suspension, allowing the footballer to resume playing for the entirety of the 2015 season. The New England Patriots won the Championship Game and went on to win the 2015 Super Bowl, with the accused quarterback named MVP. The Second US Circuit Court of Appeals went on to reinstate Brady’s four-game suspension, which he accepted and which came into effect for the 2016 regular season. However, one little boy wasn’t done with the matter. Ace Davis, from Lexington, Kentucky, decided to make deflategate the subject of his school science project. I’ve never been to a science fair, but from what I’ve learned on TV, they’re mostly made up of exploding papier-mâché volcanoes, so Ace’s creation really seems quite unique. 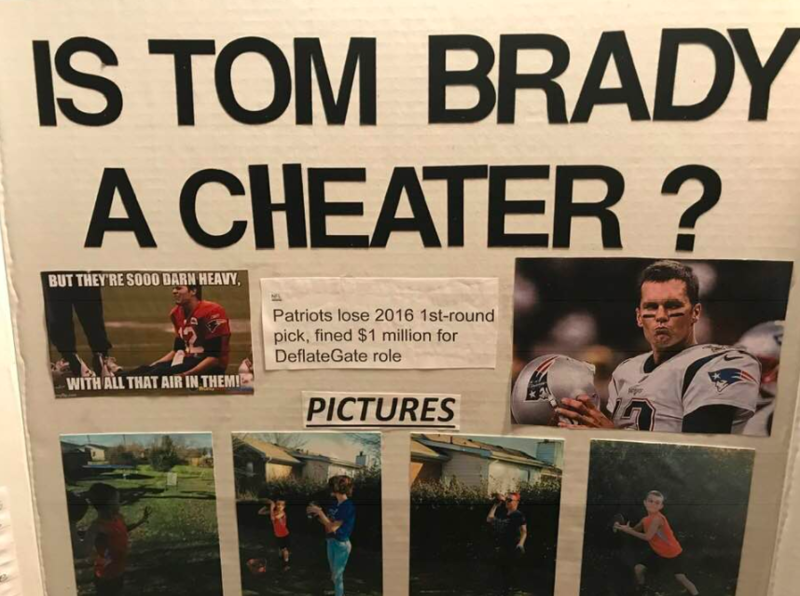 The 10-year-old used his project to ‘prove’ Brady had cheated in the games, after hypothesising ‘under-inflated footballs provide a competitive advantage in a game’. With the help of his mum and sister, Ace threw footballs which had been inflated to different levels and measured which traveled the farthest. The youngster collated his findings into hand-drawn graphs and charts, which he presented on a board explaining his workings and results. After conducting his study, the schoolboy concluded under-inflated balls did in fact offer the quarterback an advantage. The Patriots were found guilty of doctoring football [sic], thus losing $1,000,000 and future draft picks. Tom Brady is indeed a cheater. The little scientist added some colour to his board by incorporating pictures of his experiment, along with a deflategate meme and a picture of Brady crying. Ace, who’s also a quarterback, added a picture of himself in his football kit, with a big green tick above it, alongside a picture of the New England quarterback, who resided underneath a huge red cross. In an interview with NFL Draft Diamonds, Ace explained why he decided to focus on Brady’s accusation for his science project. Because I hate Tom Brady, he’s been accused of cheating before, I want him to be caught. Gimme some of your money, you don’t deserve it. Well it was worth a shot, I suppose. Brady might start to feel the heat from Ace and pay him to stop the in-depth research. After his achievement at the school science fair, Ace is now off to the district science fair, though with over 3,000 people showing the love for his project on Facebook, I think he’s already a winner!